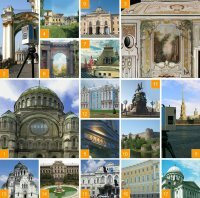 Research and Production Company “Photogrammetria” performs comprehensive architectural measurements based on modern technologies of geodesy and photogrammetry. For years the Company stays the leader in this area in Saint-Petersburg. The core of “Photogrammetria” team consists of highly qualified surveyors, photogrammeters, and programmers with over ten years of experience in a field of architecture, reconstruction, and restoration of buildings. The company team was formed on a base of the Department of Cartography and Geoinformatics at Saint-Petersburg State University which conducts research in architectural photogrammetry since 1998. Many members of the Company have graduate degrees and some of them perform research at Saint-Petersburg State University. Such a combination of scientific research with production allows us to keep a lead of the technologies and establishing standards in the area of architectural measurements for years. Remarkable objects made Research and Production Company “Photogrammetria” in the period from 1998 to 2011. 1 - Nikolsky Morskoy Cathedral (Kronstadt). 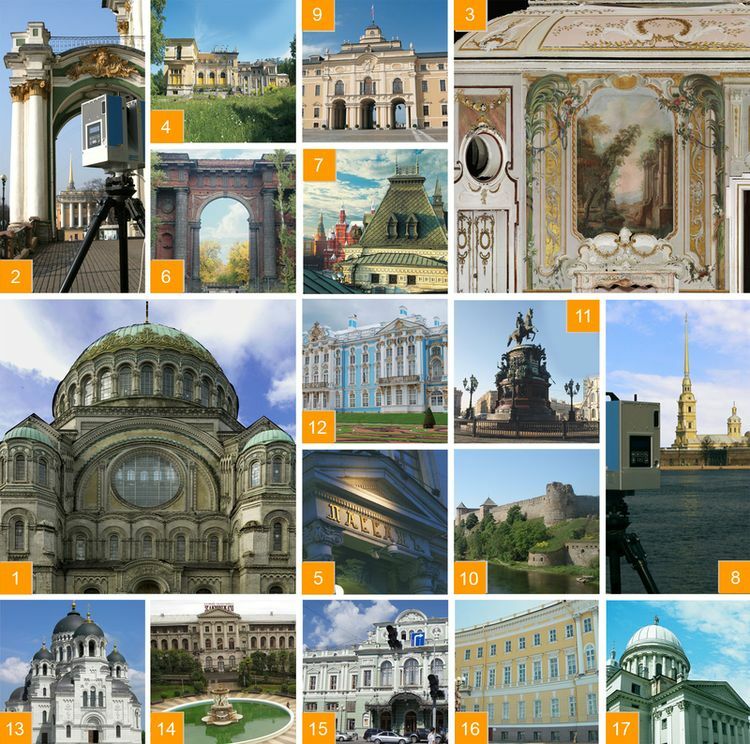 2 - The State Hermitage. Palace Square. 5 - The Passage (Nevsky Prospect). 6 - Кthe building complex on The New Holland Island. 7 - Middle Trading Stalls (Moscow, Red Square). 8 - St. Peter and Paul Cathedral. Peter and Paul Fortress. 9 - The Konstantinovsky Palace (Strelna). 10 - Ivangorod Fortress – Large and Small Gunpowder Barks. 11 - The Monument to Nikolay I (Isaac’s Square in Saint-Petersburg). 12 - Ekaterininsky Palace (Pushkin). 13 - Voznesensky Military Cathedral (Novocherkassk). 14 - Sanatorium of Ordzhonikidze (Sochi). 15 - Tovstonogov Bolshoy Drama Theatre (Saint-Petersburg). 16 - The Church of St Catherine. 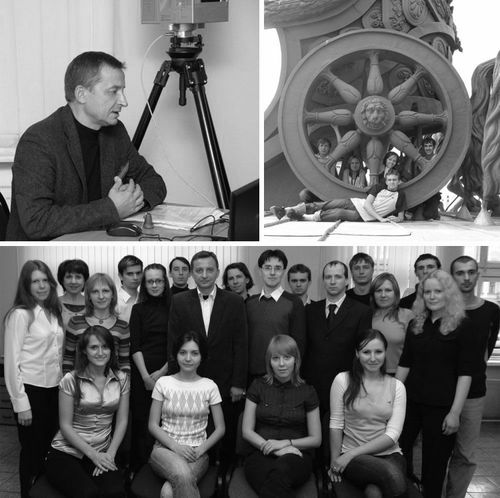 The backbone of the collective are graduates of cartography department of the Saint-Petersburg State Univercity. The youth, vitality and good academic education help our workers to cope with new technologies quickly, to develop own original approaches to different productive problems solving. Six of our specialists graduated with honours, two are the doctors of Philosophy. 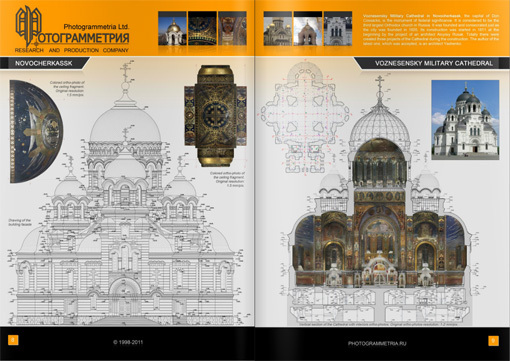 We suggest you read the brochure "Photogrammetry" Ltd, reflecting the various activities of our company. In the brochure you will find complete information about us, the description of our work on the outstanding example of architectural objects, familiar with the technology we use, used in the production tonnage work, as well as our development - software products and solutions. Download the brochure photogrammetria_ENG.pdf [50.64 Mb] (Downloads: 282) (file in PDF, size 53.1 MB, updated 10.21.2010). To view the use of Adobe Reader, which you can download here. We also offer read our brochure on-line mode.